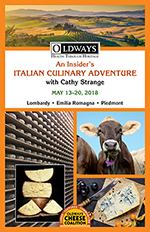 Oldways and renowned cheese and specialty food expert Cathy Strange, Global Executive Coordinator, Specialty and Product Innovation and Development, Whole Foods Market (left) hosted a week-long culinary extravaganza in Northern Italy! We started in Milan and enjoyed the city’s great restaurant scene, as well as had daytime visits to artisan cheese producers. Next we were based in Parma for several days in order to visit producers of Parmigiano-Reggiano and Prosciutto di Parma, and to experience a hands-on cooking class (everyone cooked!). We then headed to Turin and the Piedmont region to complete our week with visits to the region’s world-famous producers of wine and cheese—but not before we stopped in Modena for Aceto Balsamico Tradizionale and in Bologna to experience this fabulous food-focused city and Italy’s oldest bar. Guests arrived in Milan and checked in to the Glam Hotel. There was an opening reception with introductions by Sara Baer-Sinnott, president, Oldways; Cathy Strange; and Carlos Yescas, program manager, Oldways Cheese Coalition. After the reception, we went to Ratanà restaurant in Porta Nuova for our welcome dinner with wine pairings and a cheese course. We traveled to Cologno Al Serio to visit Quattro Portoni, a producer of more than 15 cheeses made with buﬀalo milk from their own herd. We arrived in time for cheese making, plus a tasting, and a visit with the water buﬀalos. Our second stop of the day was a tour of Igor Gorgonzola, the largest producer of Gorgonzola PDO. After, we returned to Milan for free time to explore the city. We departured early for Parma. Our guide, Alice, took us on a city tour of Parma, ﬁrst visiting the Duomo and Reggio Teatro, and then stopping at food stores in the old part of the city for tastings of Prosciutto di Parma, Malvasia wine, focaccia, gelato, and cavallo. In the evening, we went to Academia Barilla for our hands-on cooking class where everyone cooked. Teams presented their dishes to the group and then headed to the Gastronomic Library for a dinner of the food each group prepared. In the morning, we went to Latteria Sociale Centro Rubbianino Parmigiano-Reggiano to watch the making of Parmigiano-Reggiano. Afterwards, we enjoyed lunch, courtesy of the Consorzio Parmigiano-Reggiano. After lunch, we visited Principe, a producer of Prosciutto Di Parma in Langhirano, the town in the hills outside Parma that is perfectly situated for the aging of Prosciutto di Parma. We saw the entire process, from beginning to end, plus, a tasting! Dinner was held in the center of Parma at the new restaurant Oﬃcina Alimentare Dedicata. We departed for Modena to visit Acetaia di Giorgio, a small producer of Aceto Balsamico Tradizionale, where we had a tasting and the opportunity to buy diﬀerent balsamic vinegars. 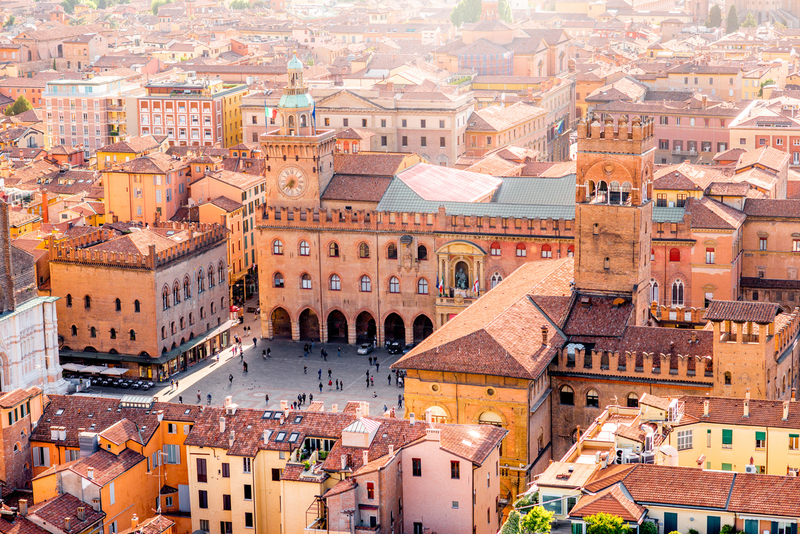 Later, we took a walking food tour in Bologna, known as “the fat one,” or the “stomach of Europe” with guide Alice to visit bakers, shops, and markets and stop in at Osteria del Sole, one of the oldest bars in Bologna. We continued on to Ristorante Pappagallo for a light lunch, and a honey pairing by Fabrizio Cazzola of Apicoltura Cazzola. Guests had a free evening in Parma. We checked out of the Grand Hotel de la Ville and departured for Piedmont. We had an early start to arrive at the Fiandino Farm in Villafalleto in time to see the cheese production. The farm has 100 brown cows and they make all their cheeses with thistle rennet. After seeing the production and the brown cows, we concluded with a lunch arranged by our friends at the Fiandino Farm. We drove to Turin and checked in to the Turin Palace Hotel. In the evening, we had a wine tasting at Signorvino Torino and then a free evening in Turin. We traveled north from Turin to Pollone (under the Alps) to visit Caseﬁcio Rosso, a fourth-generation traditional cheese producer. Then we went to Villa Guelpa to have a wine tasting and a Rosso cheese tasting, along with risotto! All had a free afternoon—to shop, to walk, to pack or to just enjoy beautiful Turin. Our ﬁnal dinner in Turin was at Enotavola Ristorant. This program provides a day-by-day itinerary of the trip, information about the history, culture, food, and wines of Lombardy, Emilia Romagna, and Piedmont, Italy. For more information on future culinarias, go to Upcoming Trips.